Paul Dano ("There Will Be Blood") is the star in "Gigantic," filming on Cadman Plaza West in Brooklyn Heights today. McBrooklyn got a photo as crews were setting up this morning. 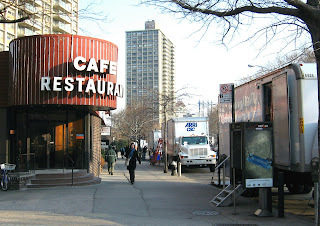 (That's the Park Plaza diner on the left in the photo.) We'll try to update as filming gets started. "Gigantic" is an "offbeat romantic comedy being helmed by first-time director Matt Aselton," according to Hollywood Reporter. Zooey Deschanel will also star. The plot involves a mattress salesman and a young woman he meets at his store. One of the crew told McBrooklyn, "The guy gets involved in a lot of strange things." There's no specific time for indie's release, the crew member said. "He'll probably bring it to the festivals next year; he hopes to bring it into syndication." omigod i absolutly love paul dano!! im so excited about gigantic!!!! Movie opens in NYC - Village East Cinema - on April 3! Come out, enjoy and support indie films! Trader Joe's Work Begins! Brooklyn Saved! Bomb Scare on Smith Street?